Material: Clear Optic Crystal Top, Black Optic Crystal Base. This award is a tribute to individuals who carry the world on their shoulders. 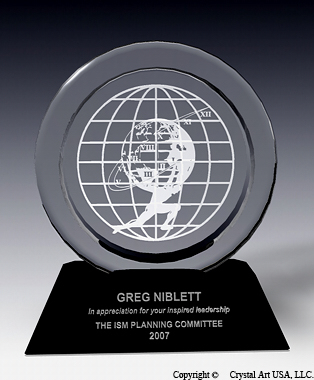 The award features the image of titan Atlas holding up the world with all his strength and might. A spiral of time encircles the globe symbolizing unrelented dedication around the clock. Give this beautiful crystal piece to those who demonstrate unsurpassed perseverance and commitment to their jobs.